The tracks for hauling the motor up are too short. They were ok for the outboard motor because the position of the carriage had to suit the outboard motor bracket – it had to simulate the transom that you would normally clamp an outboard onto. And the leg of the motor predicates the range of lift that is needed to raise and lower the prop. But this motor is different. 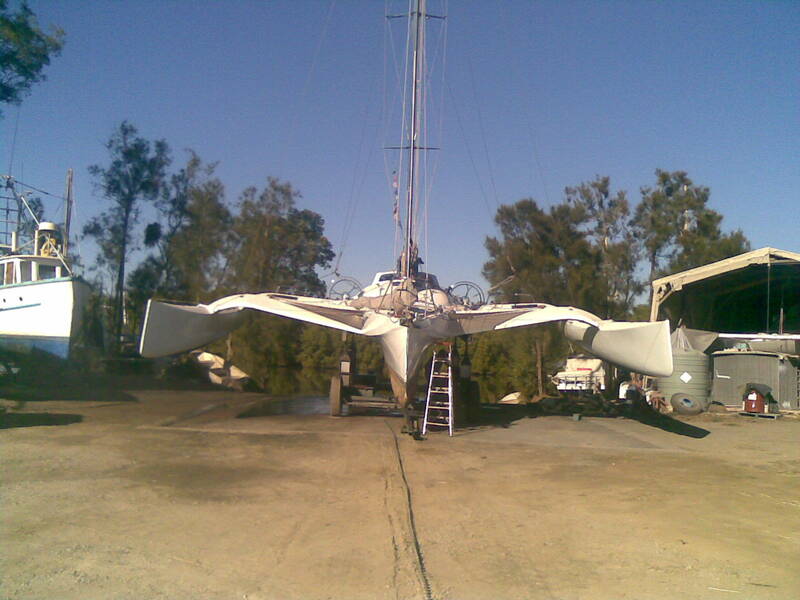 The entire motor and propeller are one unit – compared to an outboard where the motor itself is up high and dry, and the propeller is in the water. The electric motor will be underwater. Anyway, the tracks were sized to suit the lifting of the outboard. And they didn’t go all the way to the bottom of the hull. But it seems if I lengthen the tracks, then it allows the carriage to travel further – about 700mm instead of only 500mm. And this difference is enough lift the electric motor entirely out of the water. So… time for a cup of tea. The tracks used for carriage are sail tracks the cars are the usual sail track cars used to attach sheet-blocks to. After a cuppa it was obvious that I should do this extra work and make it work even better. 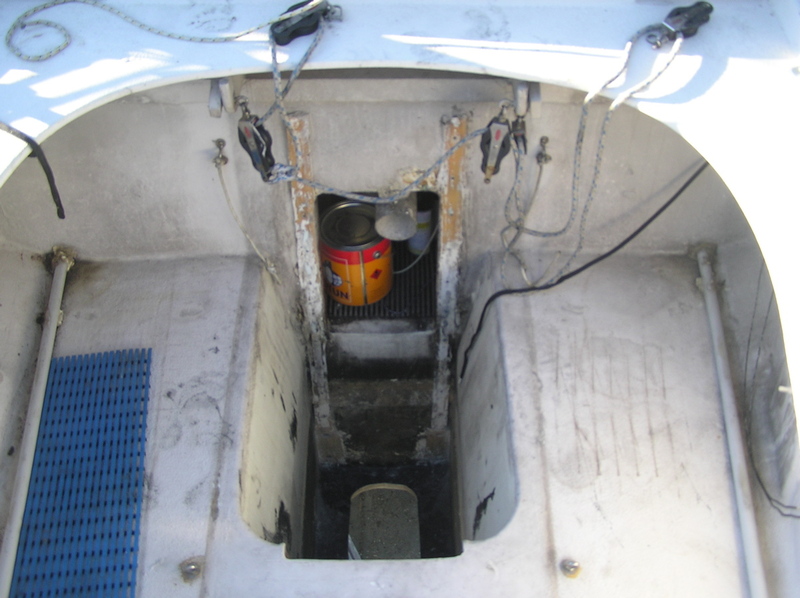 Here’s a photo looking down the well, and if you look closely you can see the pads for the sail tracks extending down, but not quite reaching the bottom of the hull. I’ve drilled some oversize holes where the track bolts will go – these holes will be filled with epoxy and then drilled out again to the proper smaller size. The expoxy will protect the balsa core which could otherwise be exposed to water. Here is a shot from underneath. 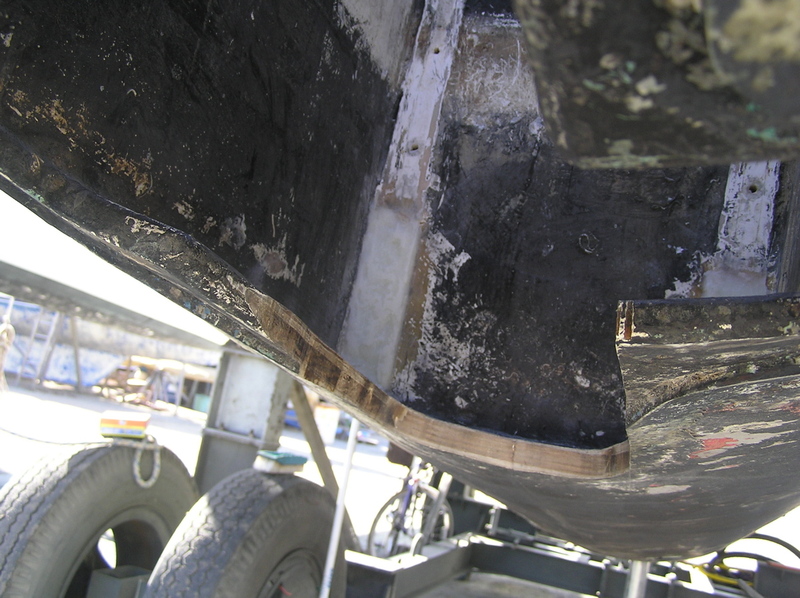 The holes have now been filled with epoxy and the pad extended for the longer sail tracks. 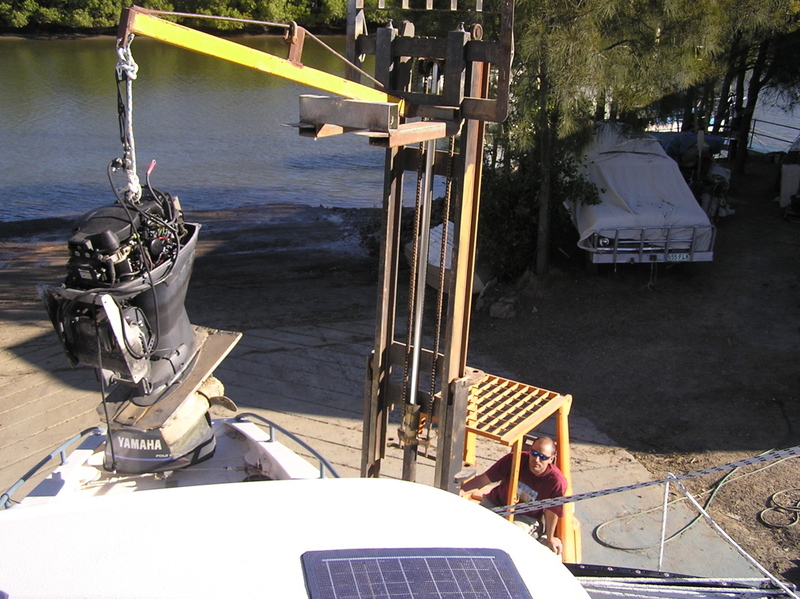 Slipping a boat at Monty’s has some unexpected benefits such as free use of the forklift which is perfect for removing 80kg of outboard motor. Here’s picture with Steve at the controls and it swinging over the stern of Current Sunshine. In the background is the languid waters of the Caboolture River. We stored it in Steve’s shipping container and we chewed the cud about how much I might get for it, and I settled on $1000 being a good price that I should get easily enough. After collecting some motor parts from Current Sunshine – barely 15 minutes – Steve tells me he’s sold it for $800 – if want to take the offer. So I did a deal with his neighbour Guy and I no longer have a fall-back position if there’s problems installing the electric motor. yikes! oh – the electric motor has arrived – its at scarborough and Steve and Mikki will bring it tomorrow. By the way, Steve Mikke are working in refitting their boat Seagull, to sell, and will then refit their other boat, Boris (I kid you not) and then hope to sail in about a year. Up the Caboolture River to Monty’s two days ago with Steve and Mikki who sounded the river in their dinghy. And today hauled out on the hard for cleaning the bottom. Here’s some photos.